Holiday marketing is a process of taking intensified measures via different marketing channels to strike the attention of customers, in intention to both provide them with extra valuable offers and hugely increase the revenue on the threshold of the holidays. Shopping holidays become ritual. Ancient people used to spend holidays burning fire, singing songs and dancing, and immolating animals. Modern people are too busy for that, so they naturally replace it all with shopping holidays. Holiday marketing is a crucial cultural phenomenon, though it may sound funny. Upgrades marketing standards. The customers got used to the holiday brand competition on various battlefields — a search bar, an email inbox, SMS, and social media. Holiday marketing taught people that they deserve more, so now they expect to be treated with an exceptional personalized buyer experience on holidays. Automatically, it heightens the demands of the brands’ quality, so they strive for the improvement. Encourages acting creatively. Catching people’s attention during an intensive holiday period is a challenging task. The brands should push their creativity to its limits and come up with emotional, relevant content to endear savvy customers. Provides customers and brands with mutual benefits. Holiday marketing brings outstanding discounts and gifts to the customers and, at the same time, rewards brands’ efforts with significant revenue and profile raising. Examines business’ ability to grow and adjust. Black Friday and Cyber Monday’s fever is a real test for the companies. Taking part in these holidays is inevitable. Holidays test if brands are able to cope with the intensity of holiday marketing. It also indicates whether certain companies are flexible and adjustable enough to work it out. Holidays can become a real hell for marketers unless they don’t know how to go with holiday marketing. Develop a plan. There is a proverb: fix your holiday campaign before the rain. Holiday marketing campaign should be planned a long time before the actual holidays. Successful holiday marketing is a fruit of a well-judged and measured strategy, so each brand should decide which marketing channels will be the most efficient. Email marketing proves to be the most effective because it is the most humane channel for communication. Detect the accordant marketing channels. The nature of the holidays is humane and emotional. Marketing channels for communications during holidays should be humane, as well. It’s obvious that the most humane marketing channel and a very efficient one as well is email marketing. It works best in conjunction with SMS campaigns. These marketing channels can be both deeply personalized. Collect user data. It’s smart to gather as much useful data as possible, to satisfy customers with targeted and personalized offers. Collect data beforehand to use it during holidays. Customize subscription forms to gather necessary information for future holiday marketing. Create an email marketing campaign. If there’s a lack of time, it is much faster and easier to launch a holiday marketing campaign with SendPulse pre-designed templates. Templates are available for Black Friday, Valentine’s Day, New Year and Christmas. Launch campaign at the right time. It is crucially important to find the right time to launch a holiday marketing campaign. It’s possible to set everything beforehand and automate the workflow with the help of SendPulse email scheduler. So, now that you know how to do holiday marketing, follow the tips for better performance. Sort out the goals. Think what you want to achieve with holiday marketing, and what resources you have onboard to carry it out. Even though miracles happen on holidays, try to set realistic aims and determine which types of discounts you would like to offer. Gift people holiday emotions. Create unique and dear emails for your consumers, something related to their lifestyle. Make sincerity a starting point for your holiday emails. You not only provide people with additional generous holiday proposals, but you also give them the spirit and positive vibrations. Personalize email and SMS campaigns. Leverage data from the previous year or two and learn what your customers will expect from your holiday emails. Try to fulfill them with a thorough personalization and targeted proposals. Don’t be too persistent. The best practice in irritating the customers is to bombard them with your proposals when it’s too early. Aspire to year-round holiday marketing. Don’t stop your holiday marketing efforts with Black Friday, Cyber Monday and Christmas. Move on and create your own niche holidays. If you own a vegetarian restaurant, create a holiday marketing campaign for vegetarians on World Animal Day. 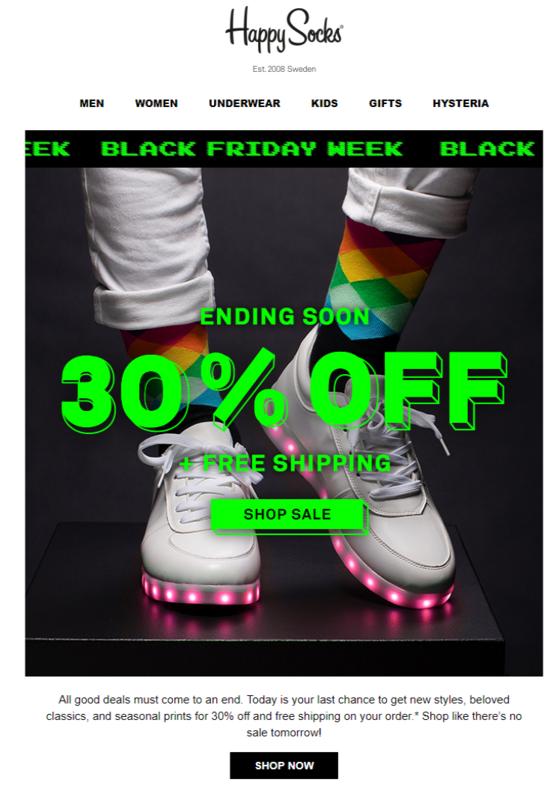 Happy Socks tempts users to buy offering $30 off and free shipping on Black Friday. 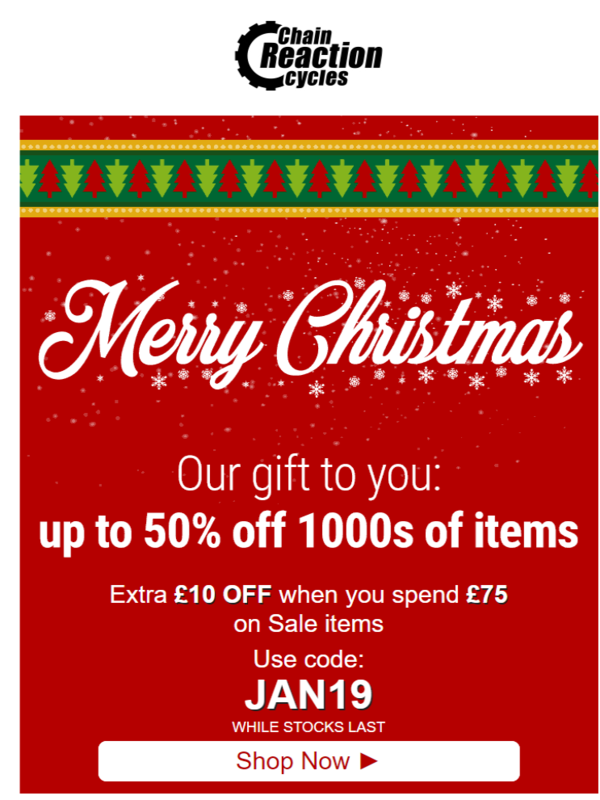 Chain Reaction Cycles give a 50% discount off 1000 of items and an extra one with a special code. LuckyBrand offers a 60% discount for all sale styles on Cyber Monday. Also searched with "Holiday marketing"
Rate this article about "Holiday marketing"
If you are interested in "Holiday marketing" you might be interested in our bulk email service.